Finally! 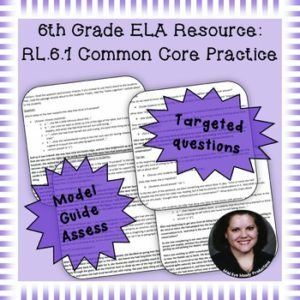 Specific, targeted practice for Common Core or LAFS Reading: Literature 6th grade standard RL.6.1 with this NO PREP resource! These questions are specifically for this standard. These three mini-lessons use the research-based “model, guide, assess” (I do, we do, you do) instructional model. If you are tired of sifting through resources that have questions for multiple standards, only to find the one you’re looking for practice on isn’t included, this is the resource line for you. Each CIM has questions that only target the specific standard, so you know exactly what you’re getting! →Important note: Because of how the state of Florida altered their standards (to become the LAFS), this tool IS appropriate for the LAFS as well. It aligns with LAFS.6.RL.1.1. In this freebie CIM for RL.6.1, there are 3 lessons designed to take less than 10 minutes each. They can be done together on a single day or on 3-4 separate days. Lesson 1: Teacher models how to find/cite strong evidence to support an inference based on a passage. Lesson 2: Teacher walks students through finding/citing strong evidence to support an inference based on a passage. Lesson 3: Students find/cite strong evidence to support an inference based on a passage – independently. All three mini-lessons use excerpts from Alice’s Adventures in Wonderland, by Lewis Carroll, which is a 6th-grade appropriate text. I know this seems like a large product to be a “freebie,” but there are only 10 pages of content on the teacher’s version. The rest of the pages are just student versions that can be printed and distributed. This file is a .zip containing 3 separate files: the teacher version (with script), student version without answer choices (open-response), and student version with answer choices (multiple choice). Student versions may be printed, copied, and distributed as necessary for the purchasing teacher’s classroom. The resource is in .pdf format.